Since I started posting before with no image, some of my popular post does not create thumbnails. As a result, there are posts on the list that tends to be out of place with the others. So to resolve this, I have added a default image on the popular post list in case there is no thumbnail for the post. 1) Go to the "Design > Page Elements" Page and add the "Popular Posts Gadget"
Note that the 'title' might be different in your case. 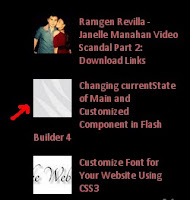 this I have to do with my blogger blogs, oo nga what about WP blogs? Hi Ajibanda it does look nice on your blog it is Facebook recommend post widget.